Children in the Pre-School Program range in age from 3 years old to 5 years old. The children are grouped according to age and developmental levels. The ratio of adult to child varies from 1:7 to 1:8 depending on age and group size. 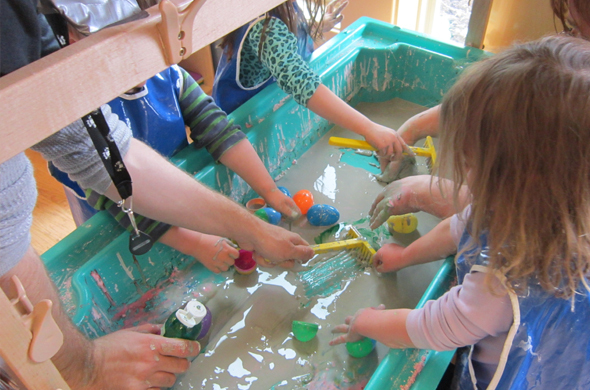 There are two preschool classes based on the developmental abilities and ages of the children. Each group has a teacher and assistant teacher. There is a 3rd assistant teacher who works with both preschool programs depending on the needs of the group. There must be an opening available in the Preschool Room. Child must be within two or three months of 3 years old. If able developmentally, the child should be able to use the toilet. If able developmentally, the child should be able to use silverware. The Toddler Room teacher discusses with parent the child’s readiness. Toddler Teacher will informally introduce Preschool Teacher to toddler’s parent(s). A meeting between Preschool Teacher and child’s parents will be arranged. The Preschool Teacher will visit the toddler in the Toddler Room. Toddler Teacher will visit the Preschool Room with the child on first day of transition. On the third day of transitioning, the child will spend the entire day in the Preschool Room. Transitioning from the Toddler Room to the Preschool Room will take approximately three days.